Reading the Maps: Who's top of the revolution pops? Over at his Adventures in Histomat blog Snowball has made a list of his 'top ten revolutions'. It's not clear what the criteria for inclusion in the list are, but what strikes me is the way that eight of Snowball's revolutions took place in European countries. I wouldn't want to question the heroism and importance of the Spanish revolution of the 30s or the Hungarian rising of 1956, but isn't it a fact that, in the last century at least, the vast majority of popular uprisings have taken place outside of Europe, in the colonies and (in economic terms) semi-colonies of the Third World? As I suggested in an earlier response to Snowball, Thompson never achieved a really clear understanding of the nature of Stalinism, but this failure doesn't invalidate the points he is making here. I've made an off-the-cuff list of what I think are the ten most important progressive revolutions of the past hundred years. Russia 1917 - The biggie. No need to argue with Snowball here. The Chinese revolution 1926-49 - After the failure of the European revolutions of the late teens and early twenties revolution in China represented the last hope to prevent the encirclement and degeneration of revolutionary Russia. Stalin's insistence that the Chinese Communist Party form an alliance with Chiang Kai-shek's nationalists led to disastrous defeat, and set the scene for Mao's remoulding of the Party on a rural, peasant-focused basis. The revolution that eventuated in 1949 consequently lacked a basis in the urban working class, and allowed Mao and others at the top of the Party to set up a bureaucratic, deformed workers' state rather than a healthy socialist state. Nevertheless, the Chinese revolution created huge benefits for hundreds of millions of Chinese peasants, liberating them from semi-feudal tutelage to landlords. The breaking up of collective farms and reemergence of a class of landless peasants is one of the most tragic results of the restoration of capitalism that has taken place in China since the 1980s. Yugoslavia 1943-45 - Tito's partisans had an unusually strong base in the working class, and they proved intent on revolutionising social relations in the Balkans well before the Nazi occupiers had been defeated. Under pressure from his own working class, which had launched a huge factory occupations movement, Tito refused Stalin's orders to make an alliance with the Yugoslav bourgeoisie and to refrain from collectivising land and property. His intransigence would lead to the first open fissure in the 'Eastern bloc' Stalin had established, and provoke splits in many Western Communist Parties. Korea 1945-53 - Many people imagine that the bizarre figure of Kim Il-Sung was the dominant figure in revolutionary Korea right up until his death in the early 90s. In fact, the Korean Workers' Party was riddled with factions until the early 1950s, when Kim and his followers gained control and purged their rivals. Kim's authority was also challenged by the spontaneous movements of the Korean peasantry and working class, who established their own liberated zones and popular committees in many parts of the country after the departure of the Japanese at the end of World War Two. On Cheju Island in the far south of Korea, a popular committee held power for a year before being crushed by the US's puppet government. Grassroots organisations reappeared after the North Koreans and their allies turned the tide of the Korean War and liberated most of the south of the peninsula in early 1951. Popular influence on the government of North Korea was reflected in the country's undertaking what has been described as the fastest and most comprehensive land reform programme in history. The rise of Kim and his clique to unchallenged power reflected the failure to permanently liberate the south of Korea, and the devastation of the north and its organised working class by US bombing. Bolivia - 1952 - The Bolivian revolution is notable for its positive achievements as well as its unfulfilled potential. The great achievement of the revolution, which was led by a coalition of the radical petty bourgeois nationalists of the National Revolutionary Movement (MNR) and the Trotskyists of the Revolutionary Workers Party (POR), was thoroughgoing land reform. Without this reform, the power wielded today by the small coca growers led by Evo Morales would be unimaginable. But the Bolivian revolution failed to develop into a full-blown socialist revolution: rather than smash the old state and put their own armed followers in its place, the POR-supported MNR government nursed the old army and police forces back into shape, to the pont where they were able to quash moves by workers, and especially miners, to collectivise the commanding heights of the economy. Cuba - 1959 - 61 - The petty bourgeois nationalists of Fidel Castro's 26th of July Movement overthrew Cuba's rotting Batista government with astonishing ease, but encountered huge obstacles as soon as they took power. Faced with a revolt by foreign capital and war from the United States, Castro turned leftwards, enlisted the support of the Soviet Union, and acceded to worker and peasant demands for the nationalisation of the economy. Castro was able to put a lid on the revolutionary process, and protect his own authority from the ravages that workers' democracy would have brought, because of the relative weakness of the organisations of the Cuban working class, and the Stalinism of the country's Communist Party. The survival of revolutionary Cuba has been an inspiration to millions of Latin Americans, and the establishment of workers' and peasants' democracy to match the country's collectivised economy probably depends on the fortunes of revolutionary movements outside the country, and in particular in Venezuela. The increased openess to political debate that has emerged in recent years - an openess that now extends even to the ideas of Trotsky - is encouraging. Algeria 1954-65 - The Algerian independence movement triumphed against the might of an unbelievably brutal French military, and in the early 60s the newly liberated country looked on course for social revolution, as Ben Bella's government pronounced itself socialist and allowed the nationalisation under workers' control of hundreds of businesses. Sadly, it was not to be - Bella was deposed, the Marxists who had supported him were criticised for their naivety, and a conservative clique closely linked to the new state's military began to reverse the gains of the revolution. What could not be reversed was the blow to French imperialism that inspired liberation movements in scores of other oppressed nations. Vietnam 1945-75 - When the Japanese occupation of Vietnam began to collapse near the end of World War Two the country's liberation movement was split by the question of what attitude to take to the country's old colonial power France. On the one hand, the Moscow-backed 'orthodox' Communists favoured allowing the French back into the country, in return for the promise of decolonisation. On the other hand, the Trotskyists, who had mass support in a number of the cities, favoured fighting a revolutionary war of independence against the French. The Stalinists allied with the French and used force to win the argument against the Trotskyists, only to have their own hopes betrayed by the colonial power. Like Mao almost two decades earlier, Ho Chi Minh was forced to resort to a rural guerilla war to try to defeat the imperalism of France and then the imperialism of the US. The story of that epic struggle is well-known, the defeat that it eventually brought to the US still haunts the wargamers of the Pentagon. The pity is that the outcome of the struggles of the 40s made a protracted war of independence necessary, and allowed Ho and his clique to cement their control of the Vietnamese revolution. Iran - 1979 - Today many people associate the Iranian revolution with a few mad mullahs, but Ayatollah Khoemini's ascencion to power was achieved only after a desperate struggle between his movement and the left-wing working class forces that had established workers' councils in many places, including the strategically vital oil industry. A civil war raged in parts of Iran through the early 80s, but eventually Saddam's US-sponsored invasion of the country allowed the clerics to rally the population behind them and marginalise their enemies. Earlier, President Carter had wanted to use force to keep the Shah in power, but had been dissuaded by the threat of Soviet intervention. The US's desperation to reverse the Iranian revolution, even after its socialistic features had disappeared, reflects the strategic importance of the country, and the realignment of power the fall of the Shah caused in the Middle East. Today Iran continues to grow into a major regional power, to the point where the US is once again considering war to reverse the legacy of 1979. For the left, the bitter defeats in the years after the ousting of the Shah have set a pattern which has seen Islamist forces displacing secular socialists in the vanguard of the anti-imperialist movements of the Middle East. 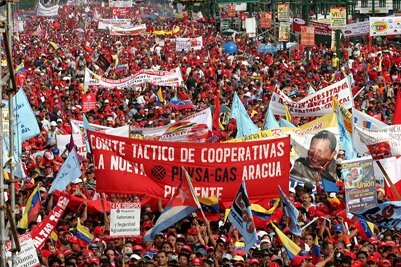 Venezuela 2002 - Although Hugo Chavez was elected at the end of 1998, the Bolivarian revolution only really kicked off in 2002, when the beleagured President was forced to mobilise his working class and peasant base to fight a revolt by a Venezuelan ruling class alarmed by his relatively moderate reform programme. The coup and lockout of 2002 were defeated by mass mobilisation, and passive electoral support for a populist leader with a minimal reform programme has turned into a revolution powered by the interaction of grassroots mobilisation and the state. Huge areas of farmland have been redistributed, a number of factories have been nationalised under workers' control, a new welfare state is being constructed, and radical experiments in the decentalisation of power to Communal Councils are underway. The Bolivarian revolution is a work in progress, with many unresolved contradictions, but its mere existence is important, because it disproves the fatuous myths of the 'end of history' and the 'triumph of capitalism' we were fed in the years after the collapse of the Soviet Union. Great stuff - really informative. My list was my current 'favourite' ones - not what I considered to be most important. The Chinese revolution of the late 1920s in particular is of vital importance here for the reasons you give. I may well reply to you on my blog when I get a moment but generally I appreciate the point you are making. What a crock. And I thought communism was dead and buried.... Sorry but still is! Just reading from your list the top of the pops were Stalin, Mao, Tito, Kim Il-Sung & Son, a few Bolivian Generals, the Castro brothers, a few Algerian Generals, Ho Chi Minh, Ayatollah Khoemini and it is still too early to tell in Venezuela. Leftist revolutionaries are naive people who are only good for rabble rousing, they are non-useful after any revolution and likely sources of instability to the state. Thankfully they are easily dealt to with a bullet, length of piano wire or an ice pick - as we can see from every example you have given here.